It all started with a box with moving pictures inside. We started calling it Television. It just had two colors black and white at that time. Years later, it was colored, later even with 3D glasses and the Imax. But could the next big development in cinema be vertical screens? This weekend, hundreds of film enthusiasts will enjoy a program of 10 specially commissioned shorts on a vast portrait-orientated screen erected in a contemporary art museum in the Netherlands. The screenings are part of a "Vertical Cinema" project – including acclaimed showings last month at Rotterdam's Arminius Church for the city's International Film Festival. 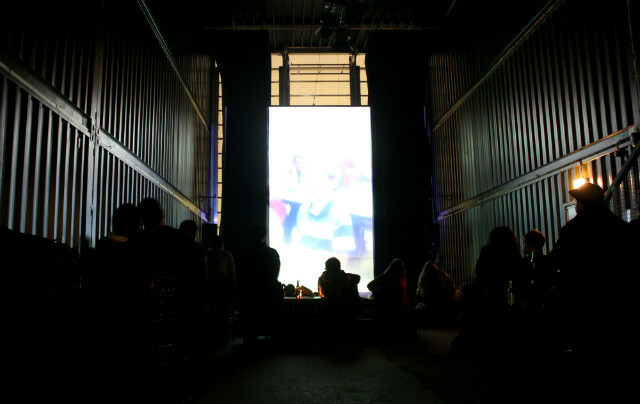 As the name suggests, the Vertical Cinema project defies the horizontal norm of cinema, and instead opts for a cinematic experiment designed for a tall, narrow space. Lucas van der Velden, a curator for Sonic Acts, which produces the program, said that the project was attracting attention because "it makes people rethink cinema, and is a reset for the eyes, ears and brain". He added: "People are excited about it because it's special and different from regular screenings." The 10 short films, described as a unique blend of abstract cinema and structural experiments, are intended to explore the idea that the format "might well be the crucial aspect of the total audio-visual experience". Audiences have been impressed. A critic from the British Film Institute's Sight & Sound magazine who attended a screening in Rotterdam praised the "bedazzling intensity of the audiovisual onslaught", adding: "Some of these works grabbed me by the gut, slapped me around the ears and did funny things to my eyes before throwing me out of the Arminius and on to the cold wintry streets of Rotterdam in something resembling a mild state of shock." Dr Erika Balsom, of the film studies department at King's College London, is giving a guest lecture ahead of the screenings at the Stedelijk Museum in Amsterdam this weekend. She said that the popularity of vertical cinema was linked to technical developments and the "larger variability of frame proportions that comes with digitization" as opposed to previous eras when the aspect image ratio had to mirror that of the filmstrip itself. But there are other reasons for the traditional landscape screens. "Human vision is oriented horizontally. Another factor is that cinematic aesthetics were inherited from earlier forms, like theater, which had established traditions of horizontal presentation," Dr Balsom added. "In 1930, Sergei Eisenstein speculated that there was also an economic factor, claiming it's possible to fit more people in a theater with decent sight lines if the image is horizontal."